Welcome to your eco-friendly face cleansing side kick! Smooth enough for even the most sensitive of skin types, these Eco-cert konjac sponges that are grown directly for us by the manufacturer are the perfect texture to remove every little spec of dirt and grime from your face! What's even better is the addition of antioxidant ingredients bamboo and charcoal! Curious about how these konjac sponges work? We'll start at the beginning! The root of the konjac plant is harvested and then refined in to konjac fiber. At this stage the addition of charcoal and bamboo are added and everything is mixed and poured in to moulds. Once cooled the sponges are threaded with string to allow them to hang properly to dry. Bamboo eliminates dirt and build up by ensuring a super deep cleanse. Carbon and other minerals found in charcoal are star ingredients to absorb excess oil and dirt that gets trapped in pores. About 3 inches wide when wet, these vegan sponges are the perfect size to fit in your hand! The life of a well used sponge is around two to three months as they are very durable. 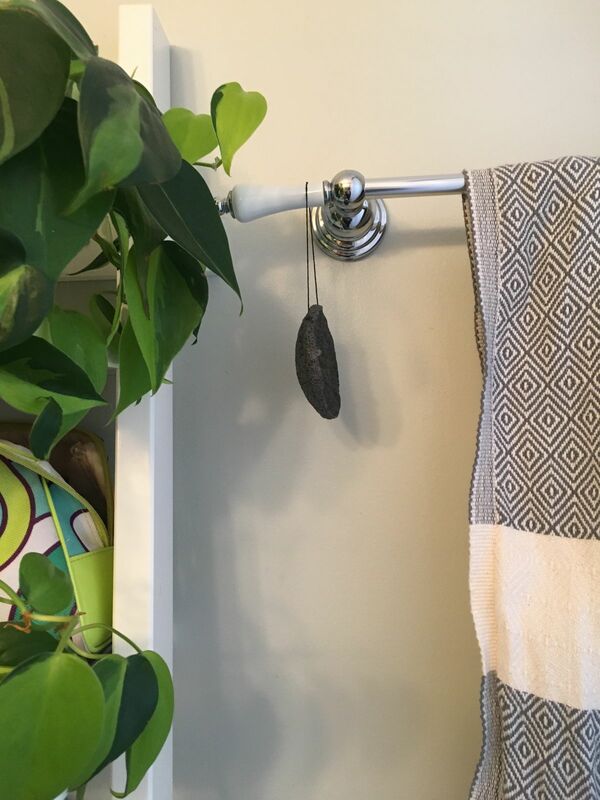 Once completely dried they shrink in size and can easily be left hanging in your shower or next to your sink until you use it again! The small size is also convenient to tuck in to your travel bag! Once you start to use our sponge we think it'll be very hard to go back to a traditional washcloth or regular sponge. Let us know what you think after you start using the konjac sponge! Charcoal • contains activated carbon and various minerals that help absorb excess oil and dirt that gets trapped in pores. Bamboo • helps eliminate dirt and build-up by ensuring a super deep cleanse. Soak charcoal konjac sponge in water until it becomes soft and press it several times to expel excess water before using. Apply your favorite cleanser (or ours!) to the sponge and gently massage your face. Rinse your face with warm water. Rinse with warm water and soap to cleanse the konjac sponge. Store and hang the sponge in a cool and well-ventilated place to air dry properly. Depending on how it is cleaned, dried and how often used your sponge should last 2 to 4 months. The bamboo charcoal sponge does an excellent job at cleaning my pores! So glad you love our Bamboo Charcoal Sponge, Wendy! So happy to hear you love our Charcoal Bamboo Sponge! And not to fret, link to that video is HERE! I use Green Cream morning and night. My skin loves it. What a great combo! Our Bamboo Charcoal Sponge goes great followed by our Green Cream! Love this sponge. It's literally my face brush! So glad to hear you love our Bamboo Charcoal Sponge! It has such a mild physical exfoliation, perfect for sensitive skin. I love the charcoal sponge in combination with Face Foam. The sponge leaves my skin feeling smooth. I store it on my towel rod so it dries out after each use. It would be great if Graydon could include in the product description a suggestion for how long you should use a sponge before replacing it. Hi Morgann, the konjac sponge usually lasts around 2-4 months depending on how it's cared for. For further instructions visit the How To Use section.